NOTE: if using an actual version of the GNU tools, there might be an issue preventing to collect code coverage as explained in this article. Be sure to read the comments section below and check out https://github.com/reeteshranjan/libgcov-embedded. To see how much percentage of my files and functions are covered? Or even to show the data with charts? In this tutorial I’m using a Freescale FRDM-K64F board: this board has ARM Cortex-M4F on it, with 1 MByte FLASH and 256 KByte of RAM. The approach used in this tutorial can be used with any embedded target, as long there is enough RAM to store the coverage data on the target. I’m using Eclipse Kepler with the ARM Launchpad GNU tools (q3 2014 release), but with small modifications any Eclipse version or GNU toolchain could be used. To generate the Code Coverage information, I’m using gcov. gcov is an open source program which can generate code coverage information. It tells me how often each line of a program is executed. This is important for testing, as that way I can know which parts of my application actually has been executed by the testing procedures. Gcov can be used as well for profiling, but in this post I will use it to generate coverage information only. Instrument code: Compile the application files with a special option. This will add (hidden) code and hooks which records how many times a piece of code is executed. Generate Instrumentation Information: as part of the previous steps, the compiler generates basic block and line information. This information is stored on the host as *.gcno (Gnu Coverage Notes Object?) files. Run the application: While the application is running on the target, the instrumented code will record how many the lines or blocks in the application are executed. This information is stored on the target (in RAM). Dump the recorded information: At application exit (or at any time), the recorded information needs to be stored and sent to the host. By default gcov stores information in files. As a file system might not be alway available, other methods can be used (serial connection, USB, ftp, …) to send and store the information. In this tutorial I show how the debugger can be used for this. The information is stored as *.gcda (Gnu Coverage Data Analysis?) files. Generate the reports and visualize them with gcov. 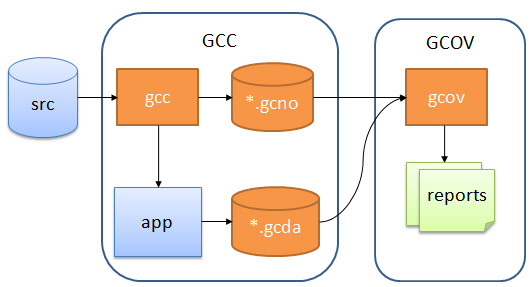 gcc does the instrumentation and provides the library for code coverage, while gcov is the utility to analyze the generated data. 💡 There is as well the ‘–coverage’ option (which is a shortcut option) which can be used both for the compiler and linker. But I prefer the ‘full’ options so I know what is behind the options. 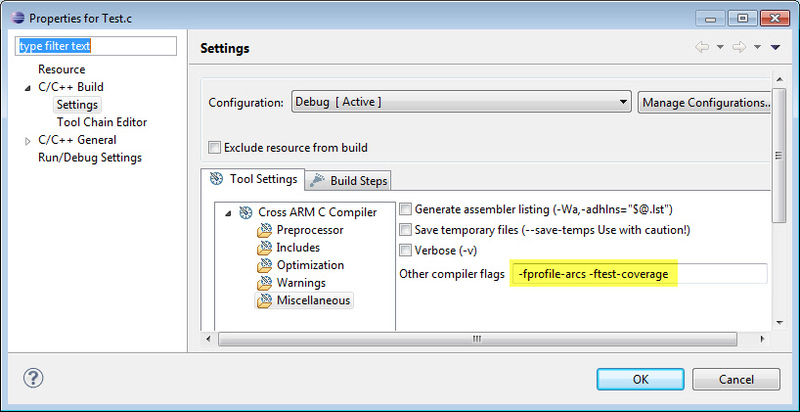 -fprofile-arcs Add code so that program flow arcs are instrumented. During execution the program records how many times each branch and call is executed and how many times it is taken or returns. When the compiled program exits it saves this data to a file called auxname.gcda for each source file. The data may be used for profile-directed optimizations (-fbranch-probabilities), or for test coverage analysis (-ftest-coverage). Each object file’s auxname is generated from the name of the output file, if explicitly specified and it is not the final executable, otherwise it is the basename of the source file. In both cases any suffix is removed (e.g. foo.gcda for input file dir/foo.c, or dir/foo.gcda for output file specified as -o dir/foo.o). See Cross-profiling. The ‘Arcs’ are the directed edges (arrows) of the control flow. It is important to understand that not every line of the source gets instrumented, but only the arcs: This means that the instrumentation overhead (code size and data) depends how ‘complicated’ the program flow is, and not how many lines the source file has. In other words: I get coverage how many times the ‘if’ has been executed, but *not* how many times ‘i==0’ or ‘j>=20’ (which would be ‘decision coverage‘, which is not provided here). See http://www.bullseye.com/coverage.html for all the details. 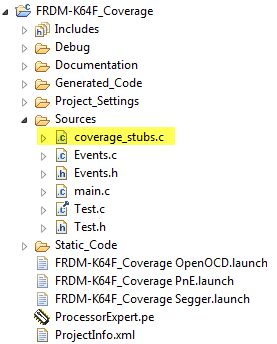 -ftest-coverage Produce a notes file that the gcov code-coverage utility (see gcov—a Test Coverage Program) can use to show program coverage. Each source file’s note file is called auxname.gcno. 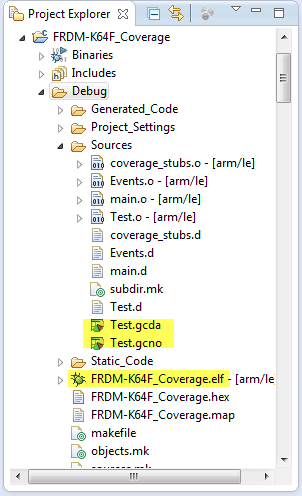 Refer to the -fprofile-arcs option above for a description of auxname and instructions on how to generate test coverage data. Coverage data will match the source files more closely, if you do not optimize. This file is needed later to visualize the data with gcov. More about this later. *  These stubs are needed to generate coverage from an embedded target. 💡 In this code I’m using the UTIL1 (Utility) Processor Expert component, available on SourceForge. If you do not want/need this, you can remove the lines with UTIL1. Such a symbol should exist for every source file which has been instrumented with coverage information. These are functions which need to be called as part of the startup code. Set a breakpoint in your code at the given address to check if it gets called. If not, you need to call it yourself. So I need to call this function as one of the first things inside main(). ❗ It might be that several kBytes of heap are needed. So if you are running in a memory constraint system, be sure that you have enough RAM available. The above implementation assumes that I have space between my heap end and the stack area. ❗ If your memory mapping/linker file is different, of course you will need to change that _sbrk() implementation. 💡 You might need to refresh the folder in Eclipse. In the next steps I’m showing how to get the coverage data as *.gcda files to the host using gdb. Open the *.gcda file with _open() for every instrumented source file. Write the data to the file with _write(). Repeat this for all instrumented files as necessary. To show the coverage information, I need the *.gcda, the *.gcno plus the .elf file. Instrumenting code to generate coverage information means that it is an intrusive method: it impacts the application execution speed, and needs extra RAM and ROM. How much heavily depends on the complexity of the control flow and on the number of arcs. Higher compiler optimizations would reduce the code size footprint, however optimizations are not recommended for coverage sessions, as this might make the job of the coverage much harder. I made a quick comparison using my test application. I used the ‘size’ GNU command (see “Printing Code Size Information in Eclipse”). So indeed there is some initial add-up because of the coverage library, but afterwards adding more source files does not add up much. 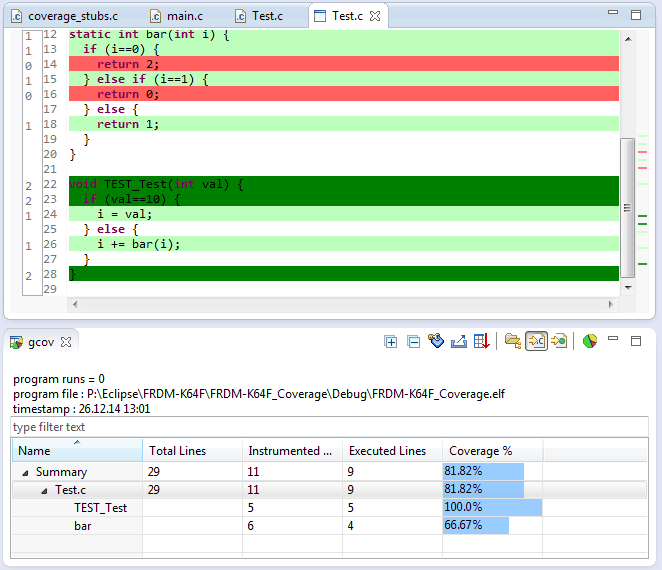 It took me a while and reading many articles and papers to get code coverage implemented for an embedded target. Clearly, code coverage is easier if I have a file system and plenty of resources available. But I’m now able to retrieve coverage information from a rather small embedded system using the debugger to dump the data to the host. It is not practical for large sets of files, but at least a starting point :-). I have committed my Eclipse Kepler/Launchpad project I used in this tutorial on GitHub. This entry was posted in Building, Debugging, Eclipse, Embedded, FRDM-K64F120M, gcc, Tips & Tricks and tagged arm gcc, Eclipse, gcov, gnu gcc, profiling, technology, Tips&Tricks, tool chains by Erich Styger. Bookmark the permalink. A useful article on the important topic of code quality and testing. However, to me, this article is mostly about how to run the tool, and I think it would be valuable if you could write a companion piece at a higher level. 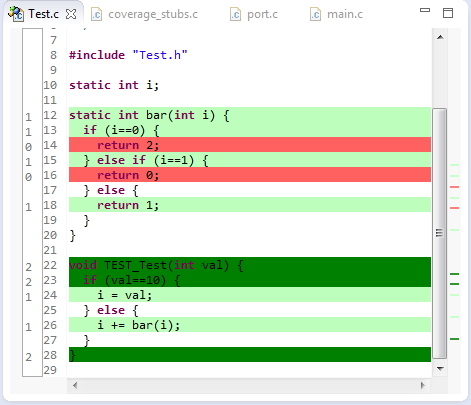 Perhaps you could extend your example to explain: (1) How to test bar(), (2) why TEST_Test() will test bar(), (3) how to run TEST_Test() – your video shows it being run in a for(;;) loop, (3) why the code coverage tool provides insight into the quality of the code and the test coverage, and (4) provide an example of a bug or weakness that this process can reveal. I don’t know whether you cover formal quality assurance methodology with your students? I do know that it is a real subject that must be addressed in even simple embedded systems, that they and your readers (like me!) will encounter frequently in the real world. For example, European and US regulators both mandate the use of IEC 62304 “Medical Device – Software Life Cycle Processes” which requires the design of a test process and the documenting of the results. It would be great if you could follow this article with others that cover GNU tools that can be used. A perfect article would take a real-world requirement of a standard and show a real-world GNU tool being used to address the requirement. A serious related question is the extent to which PE code, including FRTOS, can be used in medical devices, and other safety-critical systems. Discuss! yes, this article is about running the tools, not about the higher level motivation for coverage, tests and to meet any compliances (e.g. medical). I don’t cover that in my course because this is a very large topic on its own, and this topic is covered with other courses we offer at the university (we just have started a new department around medical technologies). As for PE code, FRTOS and any other sources or libraries: of course they can be used in any kind of applications, but it depends on the given regulations. E.g. if the regulation says that only ADA can be used, then it will be hard to find a FreeRTOS written in ADA, or that certain things like inline assembly are not allowed. But for all these kind of things the usual solution is to deal with it as an exception, and carefully document and making things compliant. 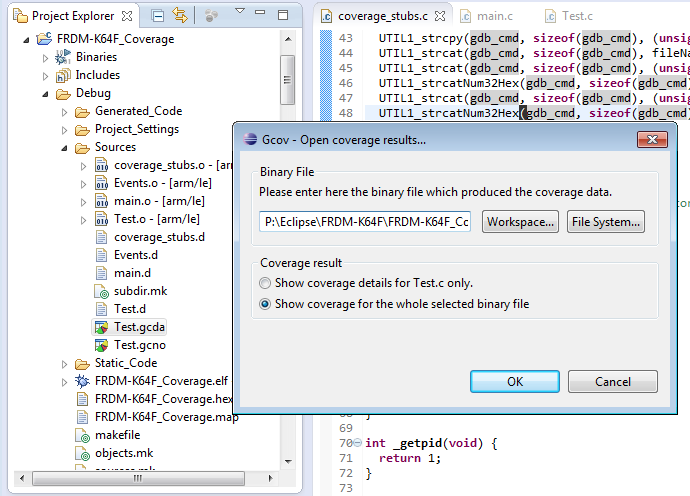 First of all great tutorial about gcov on embedded system for code coverage. Myself currently working with LPC54102 microcontroller and target was to test entire peripheral APIs. That part is almost done and we put Jenkins as CI tools for testing incremental release of LPC54012 APIs lib. Now the remaining part is the code coverage for that we use gcov. 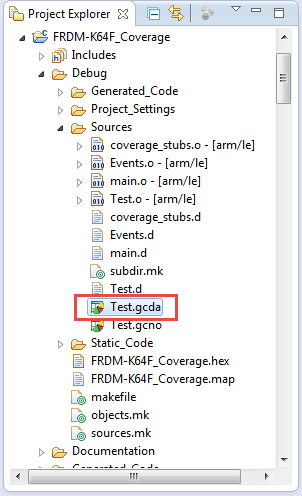 As we all know that *.gcda files are created inside target board and its always make BIG question mark!!! Your tutorial is the only way I just finding out over google. So, what I does at my end, port your entire coverage_stubs.c file and related changes in my project. Now I suffered from linker errors(about start and end init_array) in my LPCXpresso IDE(modified eclipse). My knowledge is very limited about linker script and section called .init_array. What can I do and get context about *.gcda files back to host. Compiler Error message seems like this :-Undefined referance at __init_array_start, __init_array_end symbol. But I am already defined this two symbol inside linker script within .init_array section. the other thought I have: you are not linking the proper libraries? These symbols are used with the standard libraries for the initialization code during the startup. Actually In my LPC linker script there is no any section called .init_array but after viewing your code I came across static_init function and realized that it is necessary for me to copy that part in my code as well as .init_array section symbol addition in my LPC linker script. I am using Redlib(nohost) lib currently for building my code in LPCXpresso IDE. Do you think that I’m missing something in startup code?? Yes, I think you are missing something with/in the startup code. Gcov as I have used it depends on semihosting, so you need to configure your project that it is using/working with semihosting, including terminal and file I/O. I have a system that has FatFS, an SD card, threadx and codesourcery toolchain for ARM. 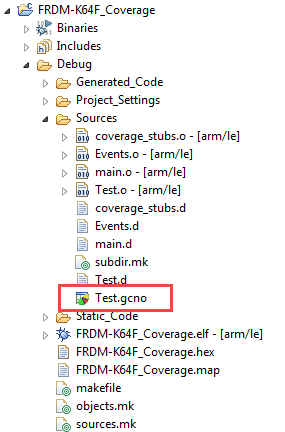 I have already added the -fprofile-arcs -ftest-coverage options and I see one .gcno file being generated. No warnings, errors or unresolved symbol linker errors are generated during the build. Then, I load the binary to the SD card. Reset the system, it works as usual, but, I don’t see the .gcda files. I’m guessing I have to add some coverage stubs to the mix. Is that correct? How would I go about doing that? Are you using an I/O library which is able to write to the SD card/FatFS? What you need is that fopen()/fwrite/etc are using the SD card and file system. This will not be the default (usually). So you need to ensure (or implement) that your standard I/O library is taking advantage of the SD card. I hope that makes sense? I checked and fopen, fseek et al are available in the system. Could it just be I need to do the linker initialuzation of the counters? that the functions are there does not say anything. Depending on your library, they could be ’empty’ and not doing anyting. Are you sure you have a full semihosting implementation available? Do you know how can I solve it? Or do you have any guidance for getting coverage for the RPi? The Raspberry Pi is using a different ARM core. I used ARM-M4/M0+, while the Raspberry Pi is an ARM11. The assembly syntax is different, so you would need to change the assembly code to ARM11 assembly code. Thanks! And where exactly do you define assembly instructions in your project? they are in the coverage stub (see as well the code in this article). Got it. I think the error is because the instruction MRS is not supported on ARMv6. Do you know any similar instruction when moving the SP to r0? it’s a very useful articles! i am trying to use the TWRK64F120M to test the code coverage. 1. how do you know the memory and the memory size to save the coverage data? 2. the *.gcda open and the gdb_cmd build are done manually? because i didn’t found the call flow of the _open() and _write(). That approach is still using a low level approach, but give you some insights how things are working internally. The above article is using semihosting. I belive I have done coverage with semihosting too, but not sure if I ever published an article about this, would have to check. 1) The size of memory is based on how many ‘arcs’ are present in the code. See the article about profiling. I usually do some trial-and-error size estimation. 2) the *.gcda files are created as part of the _exit() library call. _exit() will then call _open() and _write(). i tried to use the code coverage without profiling (set option -ftest-coverage only). 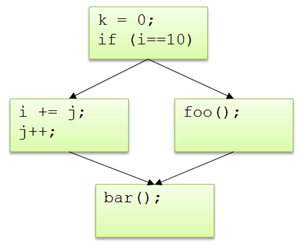 so from above code, i didn’t see the call flow of open() and write(). it is burried behind gcov_exit(). open() and write() will be called from the library. You can see this if you set a breakpoint on open() and write(). i tried the full option set -fprofile-arcs -ftest-coverage, the open/write will be called by gcov_exit. but if set the compiler option with -ftest-coverage, the open/write with never be called by gcov_exit(). did you check in the debugger if maybe the program is running into an assertion or crashes somewhere? It would be interesting to know where it goes after gcov_exit(). Beside of that: do you have semihosting turned on/enabled? If so, it will try to use the semihosting open/write. If you are using P&E semihosting: their fopen/fwrite is not implemented, so you would have to use the Segger semihosting. While I tried this with the libgcov.a from the arm toolchain path directly, I could n’t call gcov_exit() in my test application coz, the symbol was HIDDEN in libgcov.a. 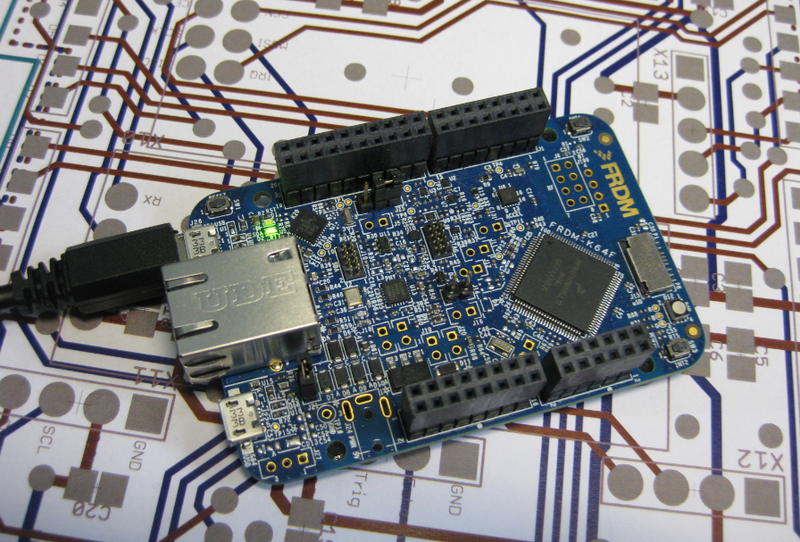 Are you using the toolchain and libraries from ARM (launchpad) and GNU ARM Embedded? that symbol should not be hidden (or static). I recommend you do not link directly with the libgcov library, but instead let the linker pick the correct libraries. Using the standard libraries directly will require deep knowledge of the linker internals. after furter investigation: it seems that this is an issue with GNU/gcc 5.x. It works fine with 4.8.4.
see this for a solution https://answers.launchpad.net/gcc-arm-embedded/+question/286502. Can you try __gcov_flush()? Yes, I was using the libgcov.a from ARM (launchpad) embedded toolchain. Now, letting linker to find the correct library, gives the following error. But I see .got data put in .text section. should I create a exclusive .got section as below. If so, will the following do? Coz, adding above sections built the binary but it didn’t boot up. I’m not using such a .got section. I was trying to do on different Cortex-R chipset with GNU. I just realized that the comment sections are only for your content, I would stay away. Thanks !! That is ONLY 1 byte and hence code coverage is 0%. But interestingly, when I try the same code on Ubuntu Machine, I’m getting the desired code coverage. Can you guide what the problem might be? If using the newlib-nano (and not newlib), the library probably writes single bytes. Are you sure that on both machines you are using the same ARM standard libraries? Using newlib-nano library on my windows machine, I’m able to get more than one byte in buffer and I’m able to create gcda files for all my source code files but when I try opening the gcda file(s) in KDS, the code coverage is still 0%. 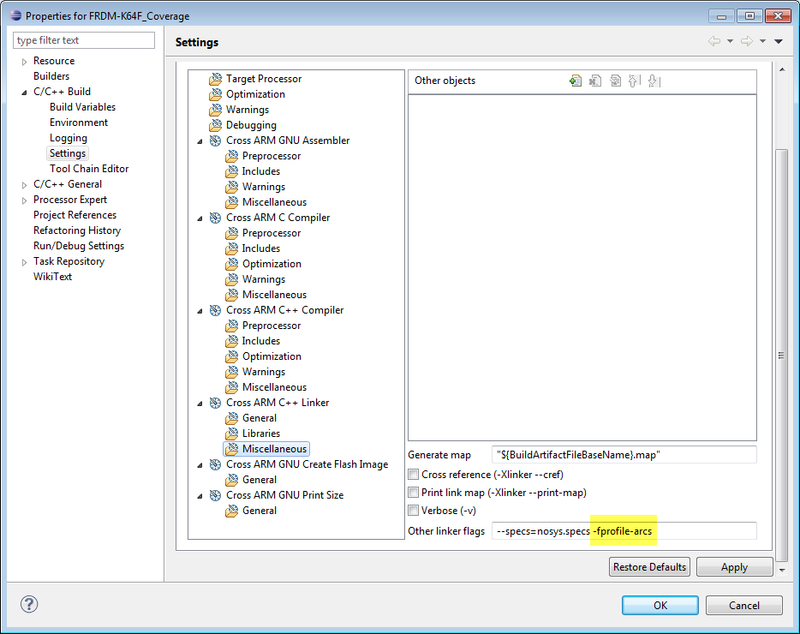 have you tried to dump the coverage information with the commmand line tools already? It could be that this works, but shows zero in Eclipse if Eclipse cannot find the necessary tools? I had to rename/copy GNU binary tools (see https://mcuoneclipse.com/2015/08/23/tutorial-using-gnu-profiling-gprof-with-arm-cortex-m/). Thanks for the pointer. Earlier I had only renamed gcov and addr2line which didnt work but after renaming strings, c++filt and nm, I’m getting code coverage! Also on double clicking on file in that view, I’m unable to see the executed lines in green and not executed ones in red colors. I’ve checked the related settings in KDS, but still nothing works. Do you had to enable any other option or any other change? either the code has not been executed at all? Or that somehow Eclipse finds other GNU tools than the one matching the ones in KDS? I did not had to set anything else in KDS, but I had to make sure that really all the correct binary tools were present. Have you tried the command line tools to verify that coverage is indeed present in your data files? To single out problems in Eclipse. Thanks for this post. Most of things worked fine except that with current version of gnu arm toolchain, which is 5-2016-q3-update as of now (https://launchpad.net/gcc-arm-embedded/5.0/5-2016-q3-update), the function __gcov_flush just hangs. It was used because gcov_exit is made static in this version. I made a port of gcov_exit starting from the gcc source for this version, and on using this directly rather than calling the gcc library’s version, I found the bug that was causing the hang. Basically, there is one gcov_info struct node per source file, and at 3 places in the flow of gcov_exit/__gcov_flush a circular list of these nodes is accessed as a non-circular singly linked list! So basically the loop never ends causing the hang. My attempt of calling __gcov_flush got stuck at the 1st of these 3 hangs. Not sure how such a big bug was introduced much later to this article being published and things working. I have published my port at https://github.com/reeteshranjan/libgcov-embedded for everybody’s use. You’ll definitely need this if you are in October/November 2016 or later till the bug in gcc code is fixed. Many, many thanks for that information! This explains why one student reported to me that with the newer GNU toolchain coverage did not work. Now everything makes sense. Many thanks again for sharing! For those who are facing issues getting the coverage to work as of today, please see my comment above and Erich’s response. I ended up getting an approach that has a major difference of not using C library API stubs. 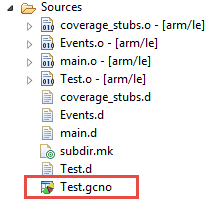 I have documented my approach here: https://technfoblog.wordpress.com/2016/11/05/code-coverage-using-eclipse-gnu-arm-toolchain-and-gcov-for-embedded-systems/. Thank you for the detailed step-by-step explanation of the procedure. I am trying to get code coverage using your approach above. But, I am a novice with these tools. I have picked up a basic ‘HelloWorld’ project to start with, using the basic eclipse C based project template. 2. I have copied your ‘coverage_stubs.c’ as it is and tried to compile, after commenting the UTIL1 commands, but my project seems o have another definition of _write, _read, _exit and other functions defined in this file. 3. Do I need to install the GCOV plugin for Eclipse to be able to get the coverage? If yes, how? 4. Is the coverage doable If I use the Debug perspective, and not the real hardware? I am really stuck here! 2) If using the standard way of writing the data with semihosting, you might overwrite these functions. 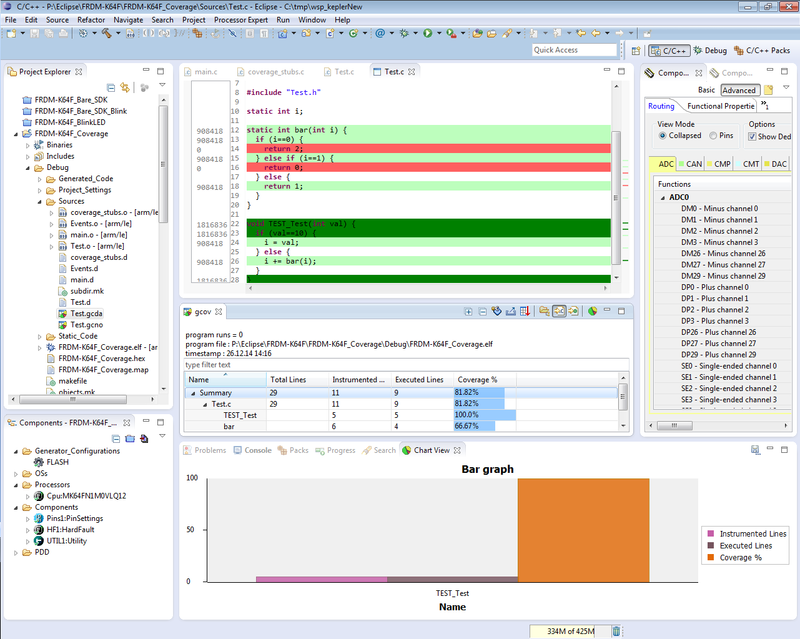 4) the debug perspective is only a set of views/windows in Eclipse. You will need real hardare to run coverage, unless you are using a simulator. Thank you so much for the response. Yes that helps. I have been able to get the code coverage. I would be really thankful if you could help me with this another question that I have. I am trying to port some test scripts written in IBM RTRT (*.ptu scripts), to eclipse, and see if I can get the same coverage as was available through IBM RTRT scripts. I need to understand if the features and the coverage reports provided by RTRT could be generated in eclipse as well? I know this is out of the scope of this page, but, just in case you are aware or if you could point me to a relevant link, that would help. Hey There! Thank you very much for this awesome tutorial! I successfully used gcov on my STM32 to get some coverage analysis. Well, now I went on adding the FreeRTOS to my Project, so the call gcov_exit() (or gcov_flush()) is done within a FreeRTOS task. Unfortunately this ends in a System Hard Fault Exeption at the symbol _etext. Is there anybody out there having success in using gcov and FreeRTOS? I usually end the scheduler and then to the coverage dump (outside of the scheduler). This requires that the FreeRTOS port supports vTaskEndScheduler(). If you want to dump the coverage information from a task, make sure you have plenty (!!!) of task stack space available. Start with 20 kByte or more. PS: I have extracted the gcov libraries from the ARM libs. That way I can run gcov in a fine tuned way. I did not had the time to publish in an article yet. I already found out that gcov needs about 17kByte stack space for my little testProject. I increased the tasks stack space to about 60kbyte. Nevertheless I am running into this hard fault exception. Instead of dumping the data with a debugger I am using some linker flags to link the fwrite routine (which is called by gcov_exit) against my own fwrite-function which then dumps the data out to the serial console. This works pretty fine without the scheduler. May I should take a look to your fine tuned source code. Did you recompile the arm-toolchain? Did you publish your that code anywhere? Your example seems to contain multiple custom implementations which can replace the libgcov.a which is used in this article above by passing the -lgcov flag to the linker. Your example decides which of these three implementations to use by using some macros in the gcov_write function. PS: Is it faster to use the Serial USART (115200bits/s) and some grep commands or a scripted debugger to dump the serial data out to the file system? What do you think ? Your analysis is correct. And using an UART will be very likely faster than semihosting as this involves a lot of stop-and-go for the debugger. But that depends on the debugger and semihosting implementation. Yes, I really did it! After inspecting the different implementations from your link, I decided to create my own implementation based on the tcov implementation https://github.com/tejainece/tcov and the tiny-coverage implementation https://github.com/aitorvs/tiny-coverage. The result is now a very easy to use gcov version which replaces the official gcov library, so I do not need to compile with -lgcov. All gcda files are now printed out to the serial console with 115200kbit/s which is about 11kbyte/s payload. My implementation works fine within FreeRTOS and needs now less than 3kByte of stack space. The output on the serial console is then converted by a little script (using some regular expression) to the gcda files. If you are interested in my implementation for your new article? That’s great news! If you could share your material, this would be really great! I am trying to do code coverage for frdm_k64f board but not using any IDE. I am facing few issues related to the linking itself. I have enabled the coverage flags as mentioned in the article and not added the change to include lgcov so that i can have my own custom gcov implementation. The issue i see, even without the lgcov my app builds without any issues but does not dump any data. Have you come across issue like this? eDeviser, Can you share the GitHub link of your changes related UART? The IDE really does not matter. It only matters if you want to use the IDE to view the data. How do you dump your data? if using semihosting, make sure you are linking with the semihosting libraries. If the semihosting is not present or if you have ‘nosys’ variants, nothing will happen if gcov reads or writes data. I am seeing issues with building itself. I am using arm-gcc compiler for building and added the arcs and coverage CC flags. Then i added my own custom gcov_init and gcove_merge_add dummy functions with prints and compiled the application. Note: I have not linked lgcov as i wanted to use my own custom fuctions. Now the compilation is successful and my app got built. But if i run the load the app on frdm_k64f i don’t see my custom gcov functions being called as i do not see any prints. P.S: Your reply did not give me an option to reply so I am replying to this comment. I suggest you try to build and use it first with a working solution, and then later go on using your own setup, step by step. That way you always have a base and previous step you can refer to. yeah i think that would be better. Thanks a lot for your time. Great! And thanks for sharing! Hey there. I tried to update to gcc 7.3.1 the linker says: “libgcov-driver.c:(.text+0x1460): multiple definition of `__gcov_init'”. I’m right now at gcc 7.2.1, not sure if it will report the same for me. But have you implemented __gcov_init() in your own code? Or did you tell the linker to link with the gcov libs? Well the compiler says, that __gcov_init us once implemented by my own implementation (https://github.com/eDeviser/lwgl/blob/master/coverage.c) and that there is a second implementation in libgcov.a which is part of the arm toolchain. And as I told you, I did NOT compile with -lgcov. Not sure what the issue is. But I can say it works fine for me with the MCUXpresso IDE and its GNU toolchain/libraries. I’m using sucessfully the GNU Tools for Arm Embedded Processors 7 – Q2 2018 release (MCUXpresso IDE 10.3.0) and don’t see that issue, maybe you can give it a try? Shouldn´t it be possible to use Segger´s RTT to get the data out of the Controller ? Yes, absolutely. I have started on such a solution (not finished/published yet). The problem is that gcoc is using file I/O which is not natively supported by RTT (unlike semihosting). So what I did is taking out the gcov library from the GNU library and changing it as such that it can use any kind of connection. I have it working from the point to dump the coverage information, but not to the point that it will open and append the data to the coverage data from a previous run. So still some work to do …. Wohoo! 😦 I just ran put of memory! Looks like the init_arrays need so much space that there is not enough memory left for the stack during runtime. Looks Like I am having too much code. yes, gcov needs more memory the more modules are covered. What I do is running multiple test runs with different parts covered if there is not enough memory on the target. I started on a project to have the coverage tables on the host to reduce the needed amount of memory on the target, but I have not finished that one due lack of time. Sounds nice. But my coverage is being procuded during a long term test which takes multiple hours. I think this is the very end of whats possible with this hardware. Yes, that does not make it easier. If you need twice as much RAM compared to what you have, you would have to run the tests twice with only one or the other half instrumented.